20 days, 06h:35m:10s £40.00 Buy now! 7 days, 22h:05m:36s £0.99 Bid Now! 7 days, 22h:07m:37s £0.99 Bid Now! 3D Pool 29 days, 04h:10m:33s £5.25 Buy now! Heroquest (Sealed) 29 days, 04h:13m:37s £12.95 Buy now! Run The Gauntlet 29 days, 04h:13m:38s £7.50 Buy now! Java Jim In Square Shaped Trouble 29 days, 04h:29m:17s £8.95 Buy now! Hexpert 29 days, 04h:31m:19s £4.75 Buy now! E-Motion 29 days, 04h:31m:19s £7.95 Buy now! Warriors Of Ras 29 days, 04h:32m:21s £6.75 Buy now! World Series Baseball 29 days, 04h:32m:21s £1.85 Buy now! Cassette 50 Compilation 29 days, 05h:13m:13s £1.75 Buy now! Snooker 29 days, 05h:13m:13s £1.75 Buy now! Now Games 2 - 5 Fantastic Games (Compilation) 29 days, 05h:17m:23s £3.75 Buy now! Spy Vs Spy III (3) - Arctic Antics 29 days, 05h:43m:50s £8.95 Buy now! 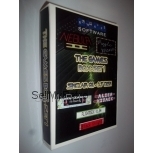 Time Machine for Commodore 64 from Vivid Image Developments 29 days, 09h:36m:33s £8.00 Buy now!